After you have created a project, added and formatted content, and developed a target, you are ready to build and publish the final output. Of course, you can build the output at any point during the development process, but if you make additional changes to content, targets, or the look and feel, you will need to build the output again to make sure the changes are included in the files that you deliver to your end users. Primary Target Do this if you are only concerned about building and publishing the primary target for your project. See Building and Publishing the Primary Target. Single Target Do this if you want to build and publish a target that may or may not be designated as your primary target. See Building and Publishing a Single Target. 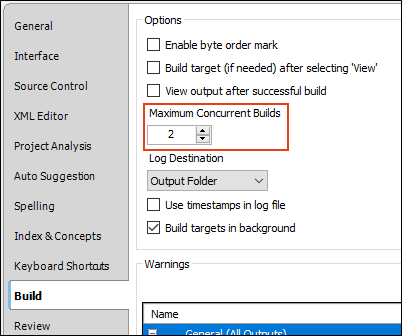 Multiple Targets Do this if you want to quickly build and publish multiple targets using an option in the Builds window pane. The targets do not need to be within the project that you currently have open. This is an alternative to using batch targets. See Building and Publishing Multiple Targets. Batch Target Do this if you want to build and publish one or multiple targets in a batch file, perhaps scheduled to run at a specific time. See Building Output Using a Batch Target. You can build and publish output (primary, single, multiple, or batch targets) using either the Flare interface or your system's command line. There are benefits to using each method. This method lets you build output using options in Flare's workspace. When you generate a target using this method, the Builds window pane opens at the bottom of the workspace. You can continue working in your project while targets are generated behind the scenes. On the Build tab of the Options dialog (File > Options), you can limit the number of targets that can be generated at the same time. This can be done by changing the number in the Maximum Concurrent Builds field. If you are concerned about Flare slowing down during builds, you may want to make sure this number is not too high. Let's say you have three targets in your project and you have the Maximum Concurrent Builds field set at 2. You generate Target 1, and then shortly after, you also generate Target 2. These targets compile simultaneously. Then you tell Flare to generate Target 3. But because your maximum number is 2, Target 3 is queued for the moment. Let's say Target 2 finishes building. At that point, Target 3 begins its build process while Target 1 also continues its generation. When you generate a target from Flare's user interface, the Builds window pane opens at the bottom of the interface. You can also open the Builds window pane manually by selecting View > Builds or Project > Builds. Rows in the Grid Each row in the grid represents a target for which you have initiated a build. By default the top row is the most recent build. Status/State The Status and State columns in the grid may display any of the following, depending on the progress of the target build: Running (Building), Finished (Build Complete/Build Failed), Queued, or Terminated (Cancelled). Warnings and Errors The last three columns display the number of warnings and errors for the target. You can open the build log to see details for the warnings or errors. In addition, if you have set Flare to ignore certain warnings—in the Options dialog (File > Options) or Target Editor—that number is also given. Background Colors The Progress cells display colored backgrounds, depending on what happens with the build. 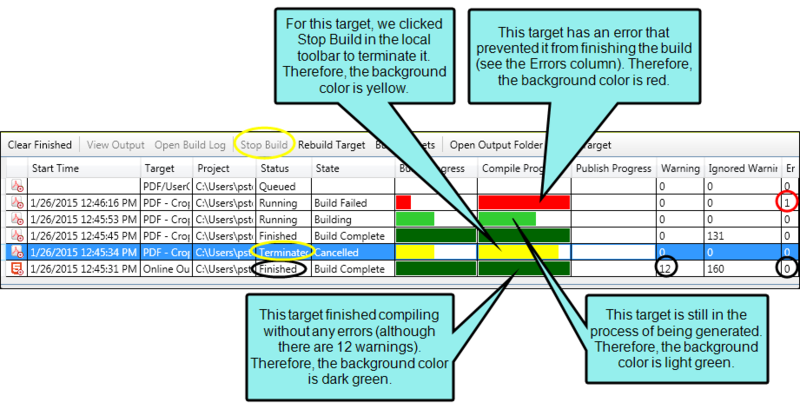 When a build is in progress, the background is light green. If the build finishes with no errors (although there may be warnings), the background turns dark green. If an error prevents the build from finishing, the background is red. If you manually stop the build, the background is yellow. Build Progress This column indicates the progress of the entire build for a target. Compile Progress This column indicates the progress of individual parts of a target's build. Publish Progress This column indicates the progress of a target that is being published to a destination you have set up. Compile Status As a target is generated, the contents of the Compile Status column change rapidly (e.g., showing the files being processed). Warning for Changed Files Because this feature allows you to continue working while targets are generated, it's possible that you might change a file that is included in a target while it is still compiling. If that happens, the target continues to build without those changes, but you will see a warning in the build log to let you know. If this happens, will your changes make it into the output? That depends on the file(s) that you changed. Flare processes your source files in the order that it finds them. So if the generation process already passed the point where it would have grabbed a particular source file, your changes from that file will not make it into the output. However, if Flare's build process has not yet reach the file in question, then the changes might make it into the output. You can refer to the warnings you receive in the build log and then look at the files in the output to see if your changes made it. 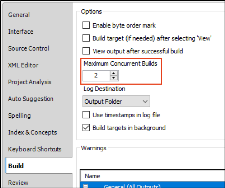 Build Logs Anytime you build a target, a build log is automatically created. By default it is stored at the root level of the output folder for that target (e.g., <project>\Output\<user name>\<target name>). However, in the Options dialog (File > Options) you can choose where your log file will be stored when you build a target. 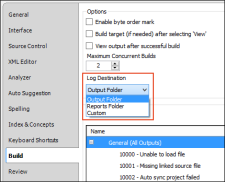 As an alternative to the default location, you can choose to place it in the Reports folder of the Project Organizer, or you can select a custom location. A build log file has an .mclog file extension. The next time you generate the target, the old log file is replaced with a new one. In the local toolbar of the Builds window pane, you can click Open Build Log to see it in Flare. 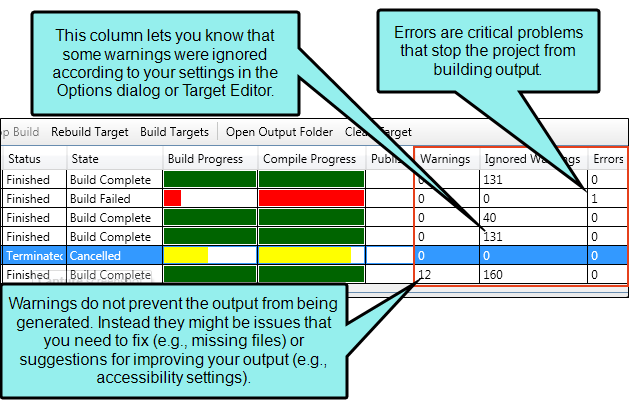 You can then see more details of any warnings or errors you may have gotten when building the target. See Opening Build Logs. Batch Targets In addition to single targets, if you build a batch target (see Building Output Using a Batch Target), the process for each one is shown in the Builds window pane. Following are actions you can take in the Builds window pane by clicking a button in the local toolbar. In most cases you can also right-click on a row and select one of these options from the context menu. Clear Finished This clears all rows from the Builds window pane. View Output This opens the output for the selected row if the target finished compiling without errors. You may need to click on the row (to first give the grid focus) in order to see this option in an enabled state. You can also double-click a row to open the output for a successful build. Depending on the type of output, you can select the device or browser you want to use to view the output from a drop-down menu. 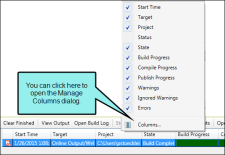 Open Build Log This opens the log file of the selected row so you can see more information about any issues with the build. You can also double-click a row to open the log file for a target that failed to build. See Opening Build Logs. Stop Build This cancels generation of the target. You will see yellow cells as a result. Rebuild Target This rebuilds the target for the selected row. You do not need to have a Flare project open at all in order to use this feature. You can select targets for any Flare project, even if that project is different from one you happen to have open at the moment. This feature functions sort of like a batch target, in that you can choose to build and/or publish multiple targets. The difference is that, with this feature, you do not need to first create a batch target file in Flare. Note: Batch targets have their own advantages over this feature. For example, they allow you to retain your build and publish settings for each target, so that you can easily reuse them in the future. Also, you can schedule batch targets to run any time in the future, even if you're not at your computer. Open Output Folder This opens the output folder in Windows for the selected row. Clean Target This lets you remove the content from the output folder for the selected target. You can reorder or hide columns in the Builds window pane. There are a few ways to do this. First, you can click on a column header and drag it to the right or left, dropping it in a new location. Second, you can right-click any column header, which displays a menu. 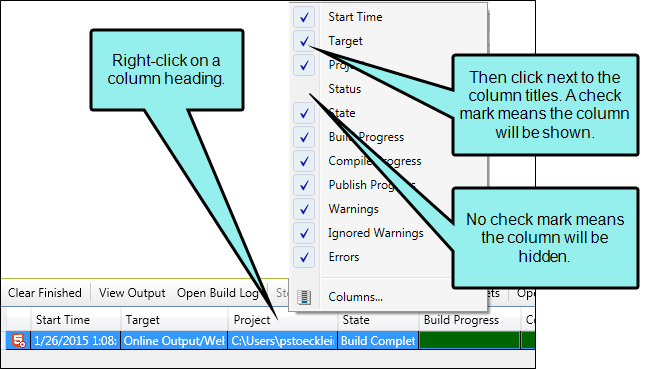 Click next to the column titles (adding or removing check marks) to show or hide those columns in the Builds window pane. Third, from the right-click menu, you can select Columns. 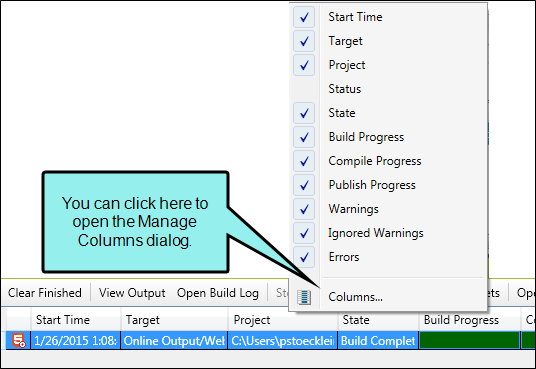 This opens the Manage Columns dialog. Again, you can show or hide columns by adding or removing check marks next to the column titles. You can also click and drag the rows up or down to change the order of the columns in the Builds window pane. Finally, you can click Reset to Factory Settings if you want to undo all of your changes and return to how everything was initially set. This option lets you build targets from your operating system's command line. Using this method, you do not have to open Flare at all. In addition, this method allows you to build a single target or all targets in your Flare project in one batch. The best way to use this feature is to create a batch file with the necessary commands in it. Then you can use a scheduling tool (such as the "Scheduled Tasks" utility in Windows) to run the batch file automatically whenever you want. This is similar to the "batch target" feature. However, the command line feature works outside of the Flare interface, is a bit more manual, and does not support as many processes. See Building Targets Using the Command Line. If you select an option in the user interface to view output from a target, Flare shows that output if it is up to date. But if there is no output or it is out of date, Flare gives you a message, asking if you want to build the output. You can select an option to avoid seeing this message for all targets in all projects. This can be done in the Options dialog (File > Options) by selecting the Build tab and choosing Build target (if needed) after selecting 'View'. Depending on the output type associated with the target, the generated output might consist of many files. You can publish Flare output to different places in various ways. This includes manually, by using the destination feature, or via MadCap Central. Select the Project ribbon. In the Build section select Open Output Folder. You can also select this button in the Builds window pane. Navigate to the folder showing the name of your target. Then you can copy those files to any location you want, whether it is on a network, in a version control directory, or up on a web server. You might need to work with your network or web administrator to learn the proper way to move files in your company, including login credentials. You can use Flare's publishing destination feature to automatically send a copy of the output files to another location (e.g., to a network folder or a website). To use this automated feature, you must first create a publishing destination for your output. See Creating Publishing Destinations. Next, associate the publishing destination with the target that you are using. See Associating Publishing Destinations with Targets. 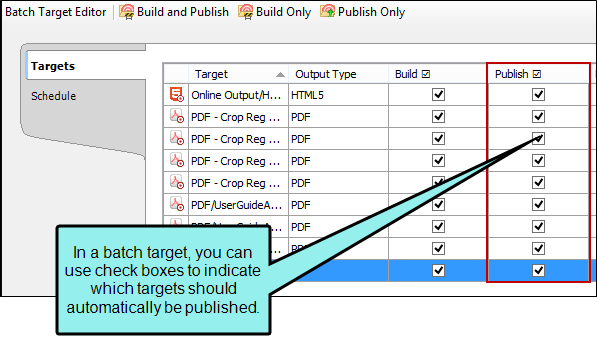 Then when you build your output (or after you build it) you simply use the Publish button or check box, depending on the method you use for generating the output (e.g., build primary target, single target, batch target). If your project is integrated with MadCap Central, you can build output from the Central interface. After that, you can mark that build as “Live” or “Keep” with the click of a button. Setting a build to “Live” means that the output can be viewed by the public. You can also set a build to “Keep” in case you want to avoid deleting it, perhaps with the intention of rolling back to it at some point (i.e., setting it to “Live”). See About MadCap Central and Flare. If you decide to use the publishing destination feature, there are different ways that you can publish the output (e.g., FTP, SFTP, source control). One of the unique methods is MadCap Connect for Salesforce®. With this integration, you can set up a destination file in Flare so that your Clean XHTML output is published directly to Salesforce®. In your Salesforce® account, make sure you turn on Knowledge. You need to create an article type that includes a rich text field. For more information, please refer to the Salesforce® documentation. After completing the necessary tasks in Salesforce®, you are ready to integrate it within a Flare project. On the next page of the wizard, select MadCap Connect for Salesforce®. After Flare is installed, open your project, create a destination file, and complete the MadCap Connect for Salesforce® fields. See Creating Publishing Destinations. This plug-in allows you to publish Flare output to your Zendesk Help Center dashboard. This is beneficial if you have a knowledge base or FAQ that supports any service desk tickets on your dashboard. You can publish directly to categories and sections you have created in Zendesk. 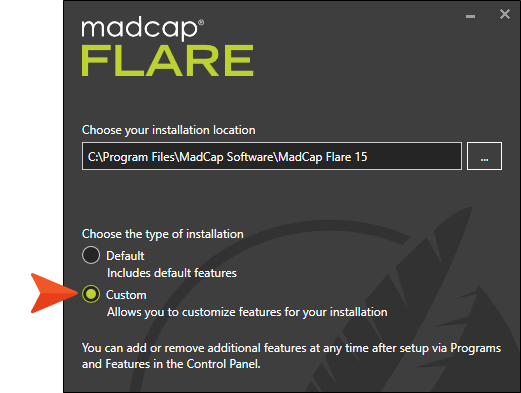 You have the option to install the plug-in when you install or upgrade Flare. 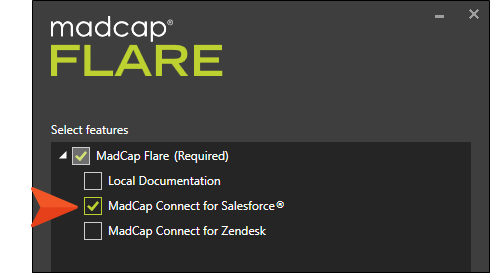 The MadCap Connect plug-in for Zendesk supports outputs using Clean XHTML and skinless HTML5 outputs. Zendesk provides multilingual support to publish your articles. See About Language Support. There are a few steps that you need to complete before you can create the Zendesk destination file. 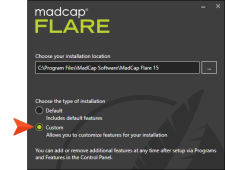 When you install Flare, choose Custom as the type of installation. Click Next. 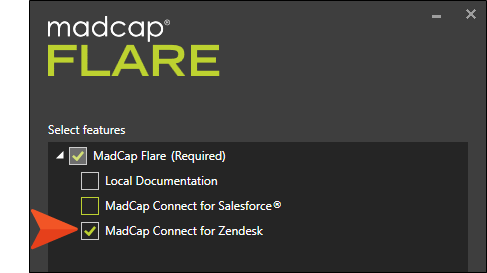 On the next page of the installation wizard, select MadCap Connect for Zendesk. Click Next. After the Flare installation is completed, open your project and create the destination file for Zendesk. See Creating Publishing Destinations. The number of files that are generated and need to be distributed depends on the output type you are creating and the settings that you provide when developing your project. EPUB output consists of a file with an .epub extension that you can distribute to users, who will be able to open the file on a variety of ebook readers. Note: Although EPUB is not really classified as either online or print-based output, it is structured more like a print-based manual than a Help system. Therefore, you can treat its distribution somewhat like an electronic PDF file. There is only one file that needs to be included—the CHM file, which is [Name of your project].chm (e.g., FictionSoftPro.chm). Microsoft HTML Help is designed to be used on a desktop, rather than being accessed from a web server. This output type requires that all files and folders in your project's Output folder be included for your end users. HTML5 is designed primarily to be published on a web server, but it can be stored locally as well. However, if you enable advanced server-based output for HTML5, it is designed to be published to a web server running Microsoft Internet Information Services (IIS), rather than attached to an application or distributed otherwise. For information about server-based HTML5 output and making it available to users, see About HTML5 Output and Enabling HTML5 Server-based Output. WebHelp is designed primarily to be published on a web server, but it can be stored locally as well. WebHelp Plus is designed to be published to a web server running Microsoft Internet Information Services (IIS), rather than attached to an application or distributed otherwise. For information about WebHelp Plus and making it available to users, see About WebHelp Plus Output and Enabling WebHelp Plus Output. Depending on your settings, Microsoft Word consists of one or more XML, DOC, DOX, XPS, or PDF files that you will distribute to users. Following are some common questions about building and publishing output. What files are produced when you build output? This varies depending on the output format. Some formats will produce a single output file, such as a PDF. Other formats might produce many files and folders. To see the exact files and folders that are produced when you generate a target, select the Project ribbon. Then in the Build section select Open Output Folder. Also, a log file is created whenever you build a target and is stored by default with the rest of the output. 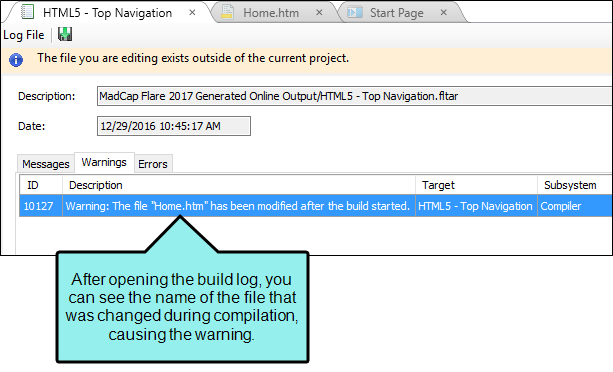 This file provides important information about the build, such as whether any warnings occurred in the process (see Opening Build Logs). 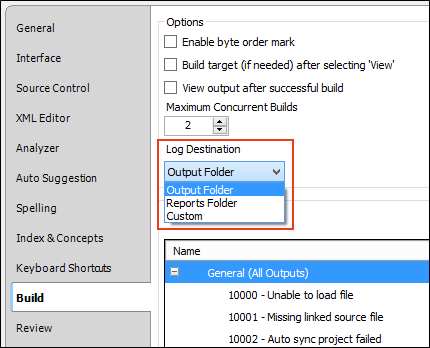 However, if you do not want your log file to be included with the rest of the files, you can open the Options dialog (File > Options), select the Build tab, and choose an external location for log files (see Options Dialog). For more details of the generated files that you need to provide to end users, see Files to be Distributed with Each Type of Output. What is Produced when You Publish output? Publishing isn’t a matter of producing anything. Instead, it’s simply a matter of taking those output files, making a copy of them, and placing them somewhere that end users can access them. This can be accomplished manually or automatically by using a destination file. See Publish Features. What happens to Old Files When you rebuild a target? In Flare, the previously generated files are all removed when you rebuild a target. These are then replaced by the newly generated files. Therefore, if you want to preserve files from an older build, you will need to open Windows Explorer and copy those files to another location so that they are not overwritten by new files. However, the situation is different if you are using MadCap Central to generate output. In Central, each build is preserved until you delete it. See About MadCap Central and Flare. What happens to Old Files When you Republish OUtput? This depends on how you choose to publish your output. If you manually replace previously published files with new ones, it is generally best to delete all of the old files and then upload or paste the new ones in the same location. If you use a destination file, you have the option in the Destination Editor of uploading only files that have changed since the previous publication. You also have the option of automatically removing stale files (i.e., those that were removed in your local project since that last publication). See Creating Publishing Destinations. Warning: Do not publish your output into your source folders (Content or Project). It is always best to publish output outside your main project folder altogether. Otherwise, you might lose your source files. Warning: If your computer's anti-virus (AV) software scans the Output folder during the build process and you experience one or more "Build Failed" errors, the AV software may be preventing the build process from accessing the output files. To avoid this, you can temporarily turn off or disable your AV scan. You may also be able to exclude the Output folder, add Flare to an exceptions list, or postpone/reschedule scans to a different time. See your AV vendor for information. Tip: You do not need to build the target to see how a particular topic will look in the final output. You can always preview topics as you develop your project by clicking in the local toolbar of the XML Editor. If you click the face of the button, the preview is shown based on the format specified in the primary target. If you click the down arrow, you can select any of the targets in your project from a menu. The preview is then displayed using the output format specified in that target. In addition, you can continue to edit the topic with the Preview window pane open. The preview will automatically update as you save changes to the topic. See Previewing Topics. Tip: Before building output, you might find it useful to run some of the analysis tools in Flare to check for issues, such as broken links. This way you can obtain a more thorough assessment of the project before generating output. For more information, see About Analysis and Reports. Note: For information on distributing an Eclipse Help system, see Creating an Eclipse Help Plug-In. Note: When you build Word output, Flare may create an extra folder called Resources (if your project contains ancillary files, such as images). If you want to embed images in your Word document, you can use an option on the Advanced tab of the Target Editor (see Embedding Images in Word Output). If you do not embed images in your Word files and you move those output files to another location than your Output folder, you must remember to also move the Resources folder. Without that folder in the proper location, the referenced images will no longer be displayed in the output files. If you convert the Word files to PDF, the images will then be incorporated into the PDF file, and you can move that single file anywhere you like.